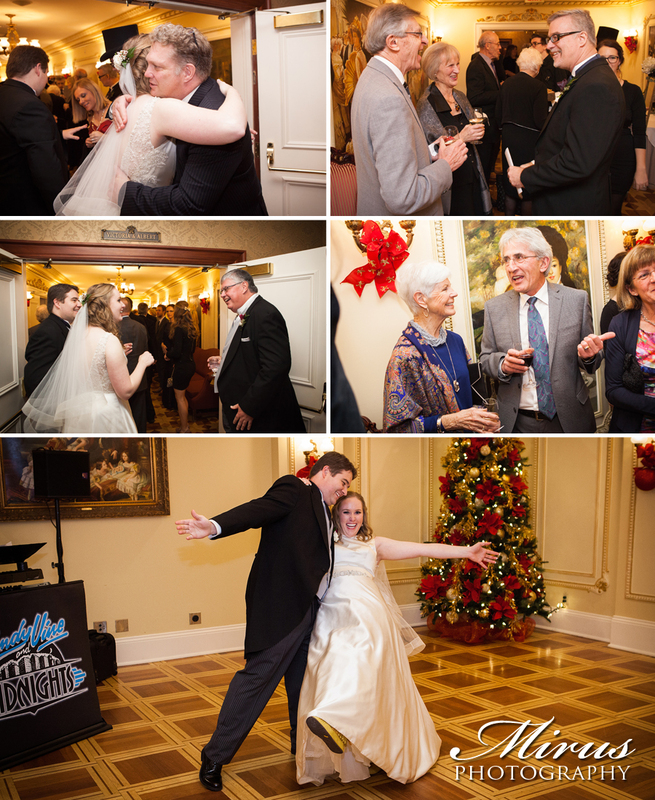 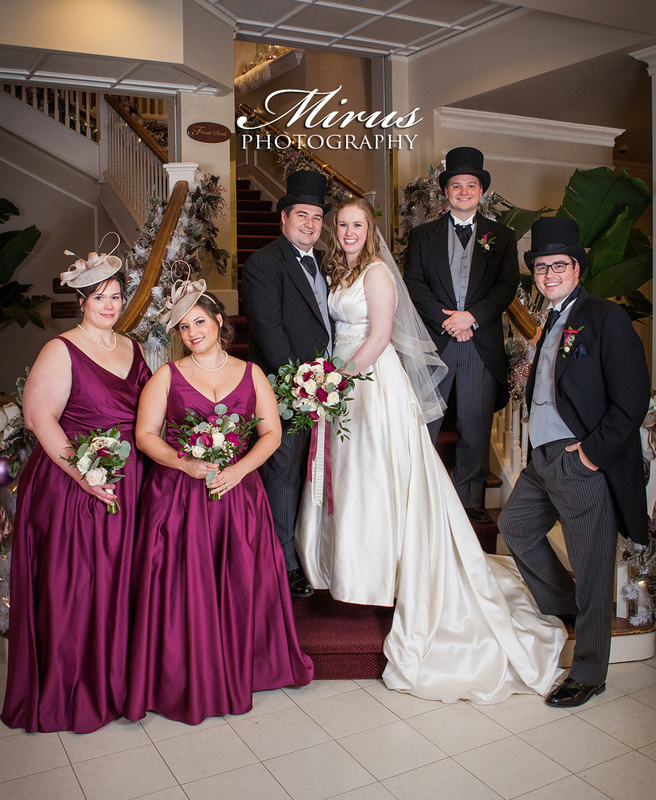 This Prince of Wales Vintage Hotel wedding was so much fun to be a part of. 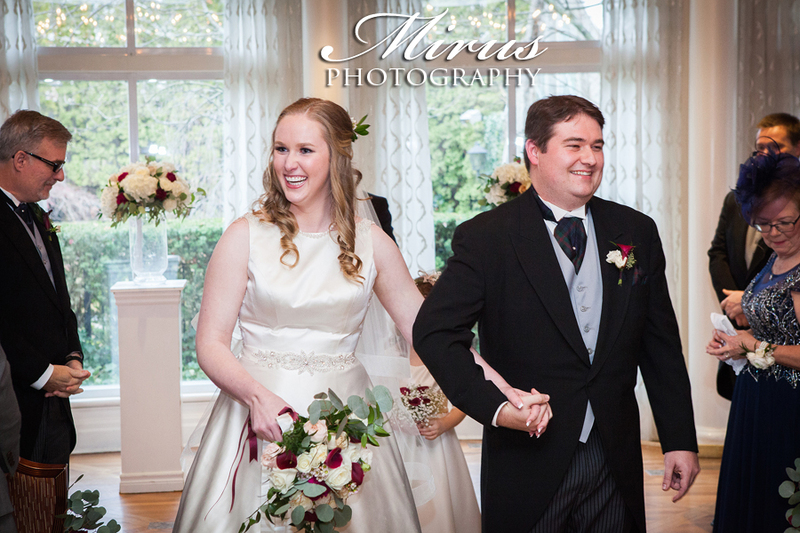 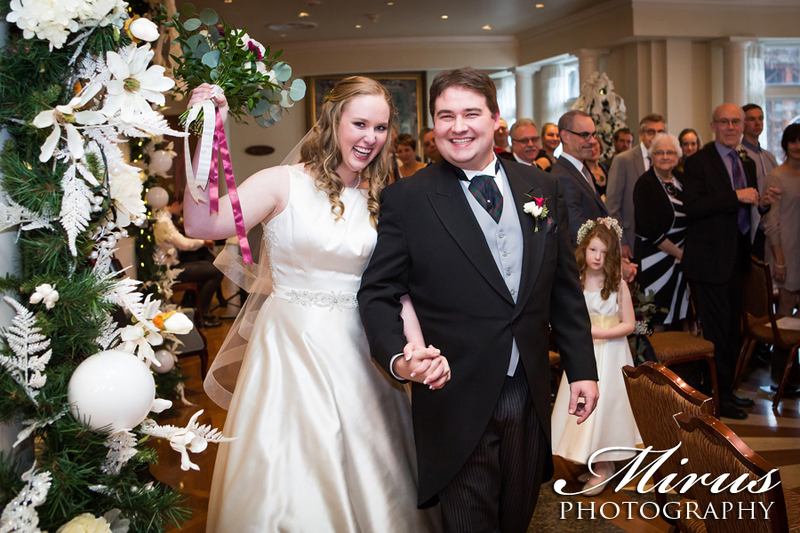 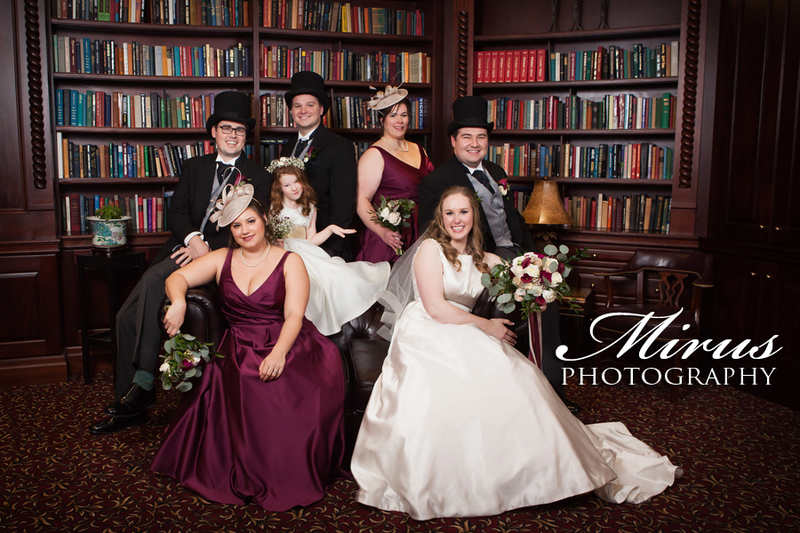 Sarah and Peter's wedding was English themed with formal attire. 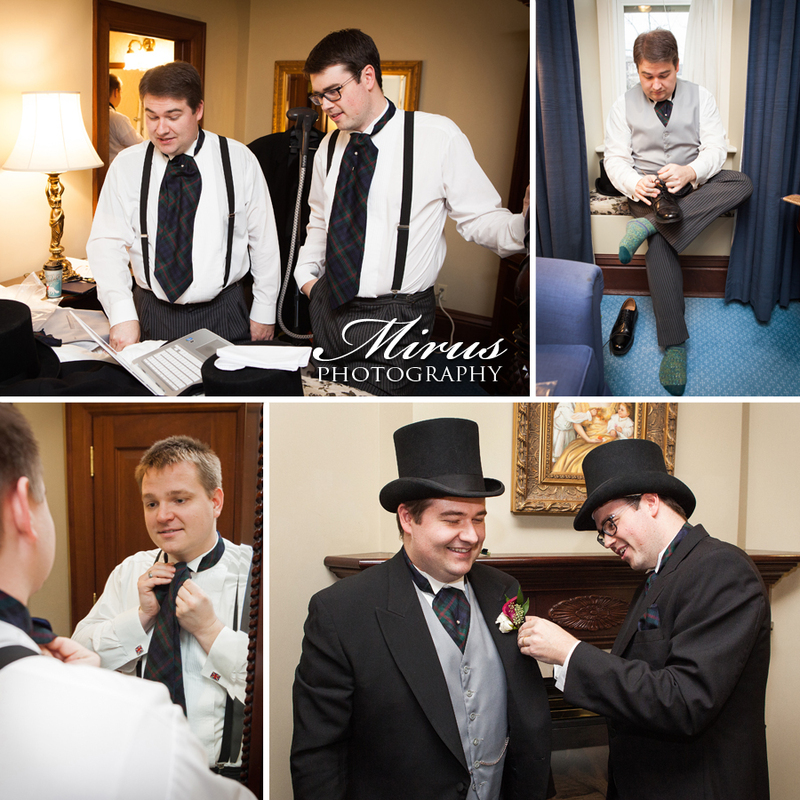 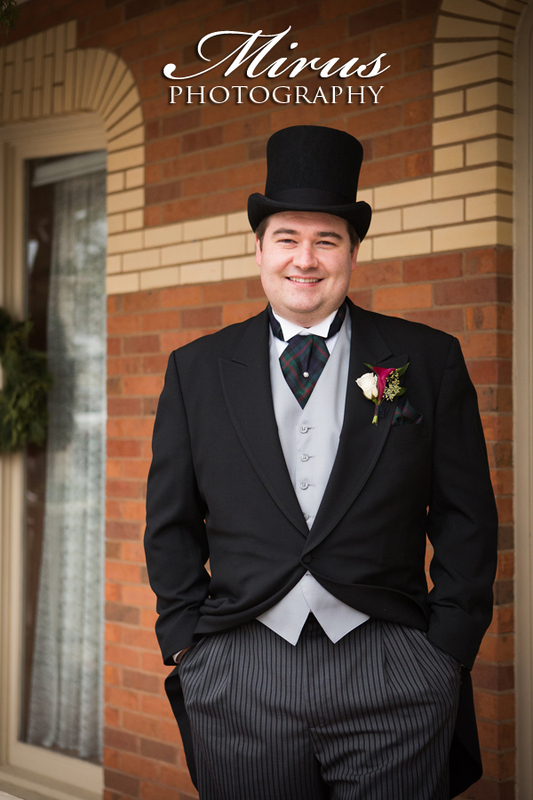 The groom and groomsmen wore top hats, ascots and tailcoats complete with a chained pocket watch. 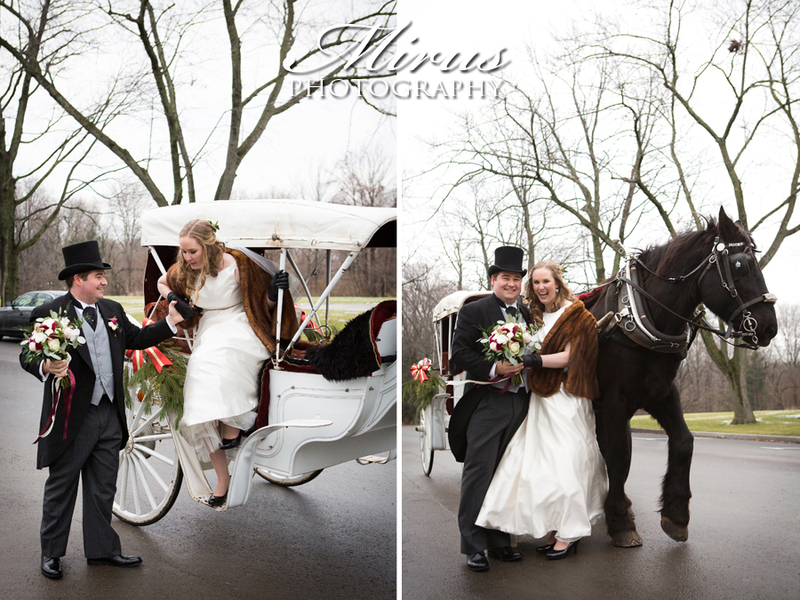 They looked fantastic and it just seemed to fit with the feel of Niagara on the Lake and the horse and buggy rides and Vintage hotels. 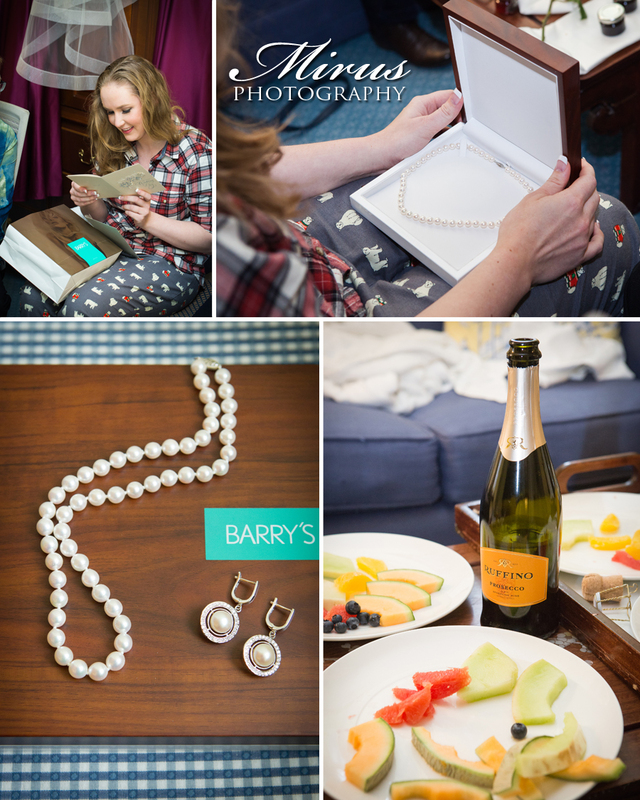 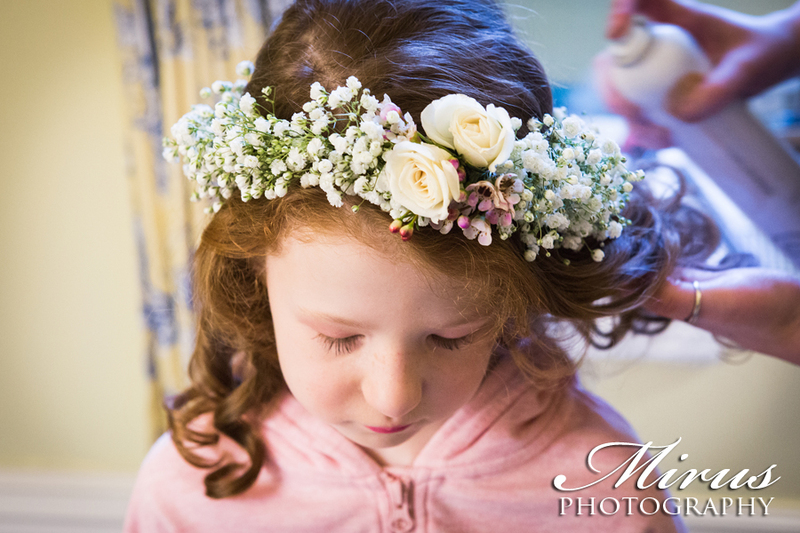 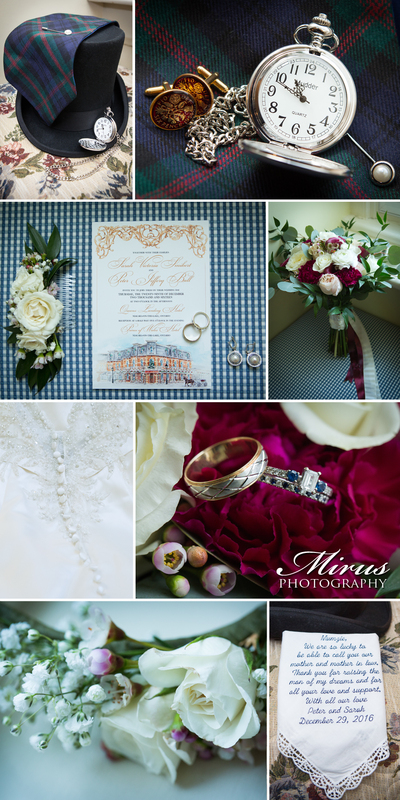 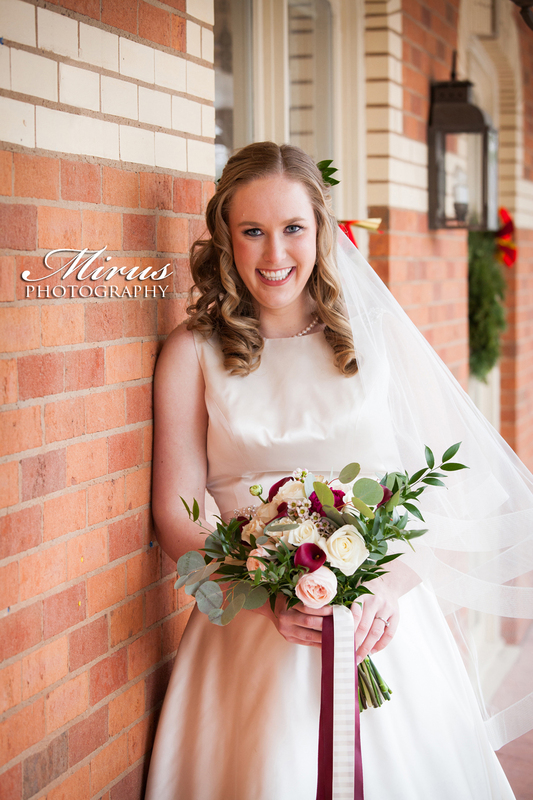 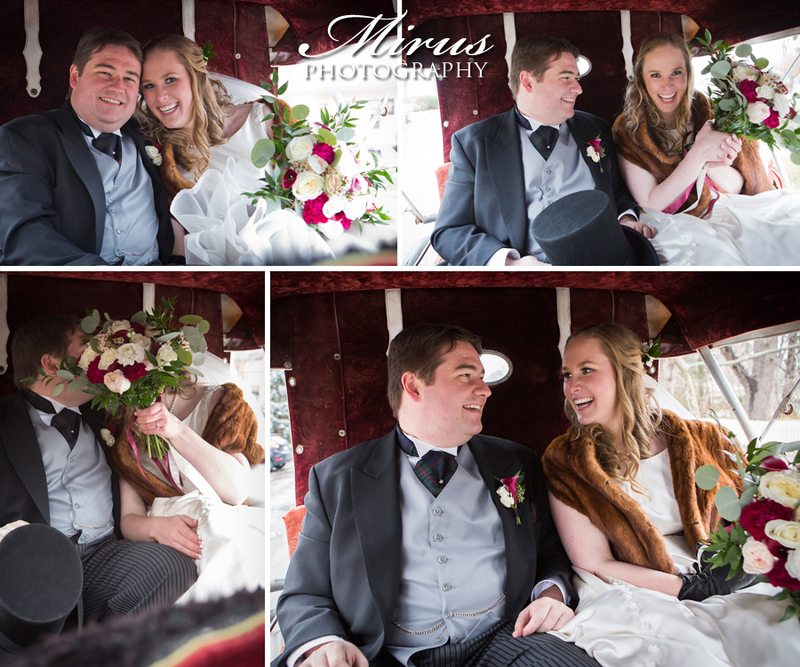 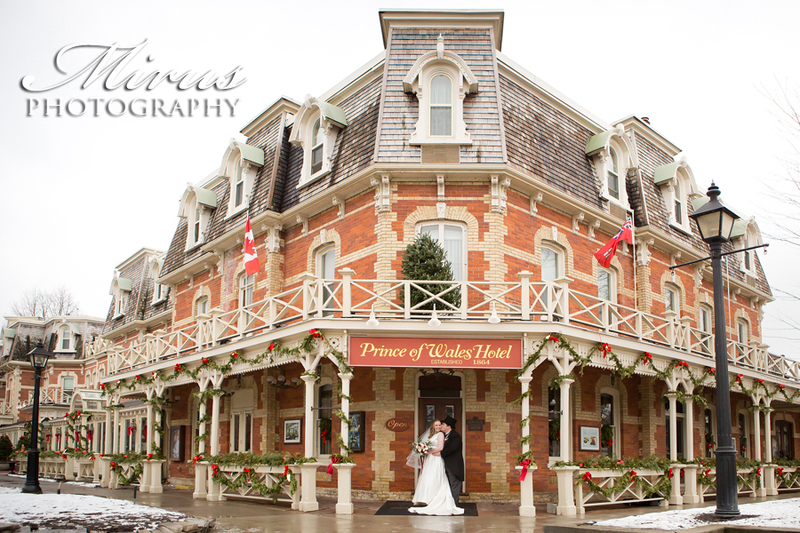 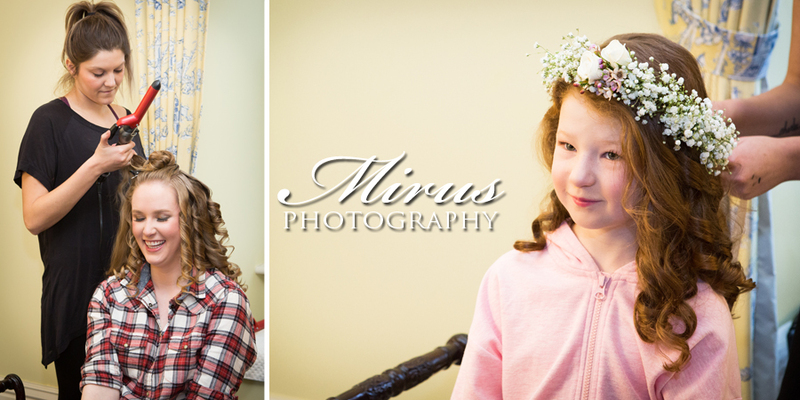 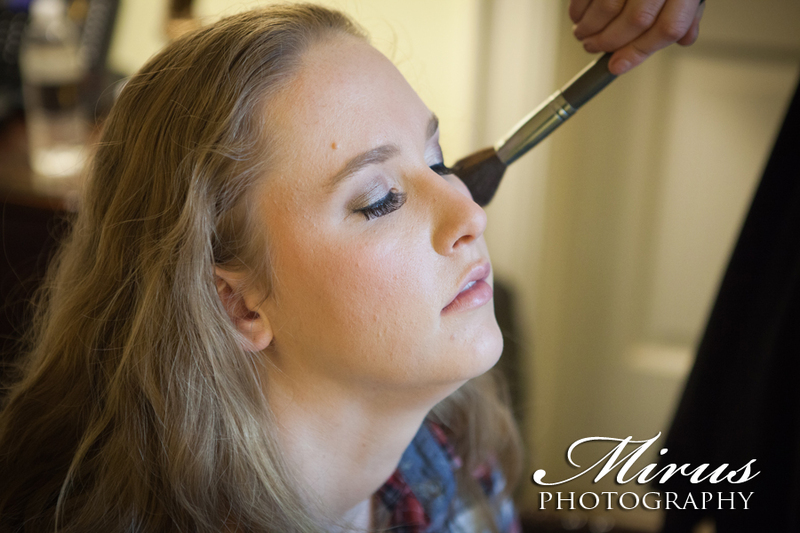 Very regal with an old world feel!Sarah and Peter both got ready at Prince of Wales Vintage Hotel. 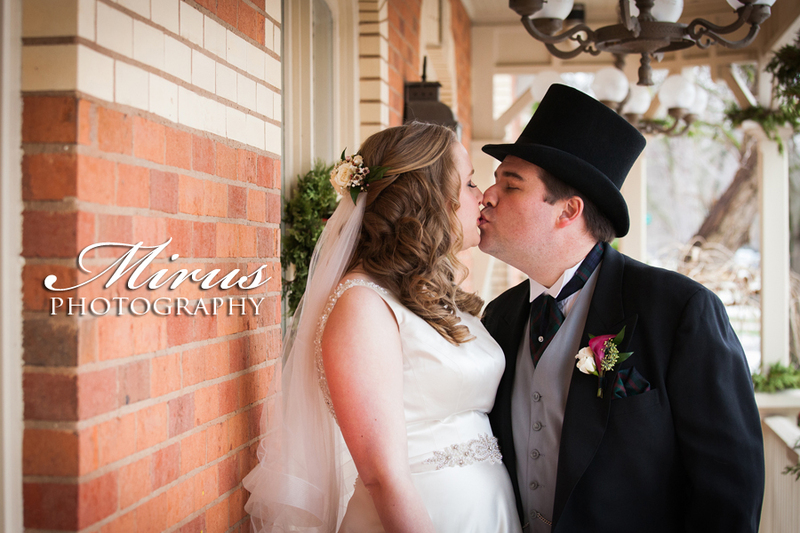 It had snowed a little the night before but there really wasn't a lot of snow that day. 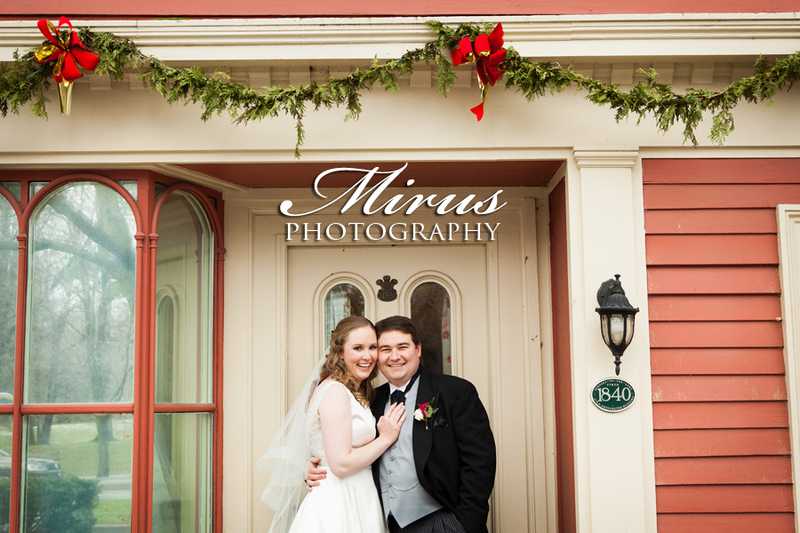 They got married at Christmas time though. 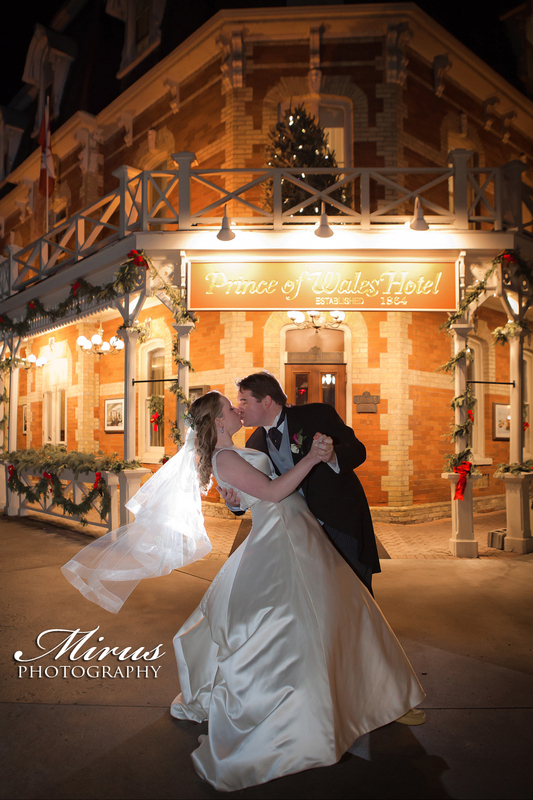 Hence everything in Niagara on the Lake was decorated for that time of year and just looked beautiful despite that. 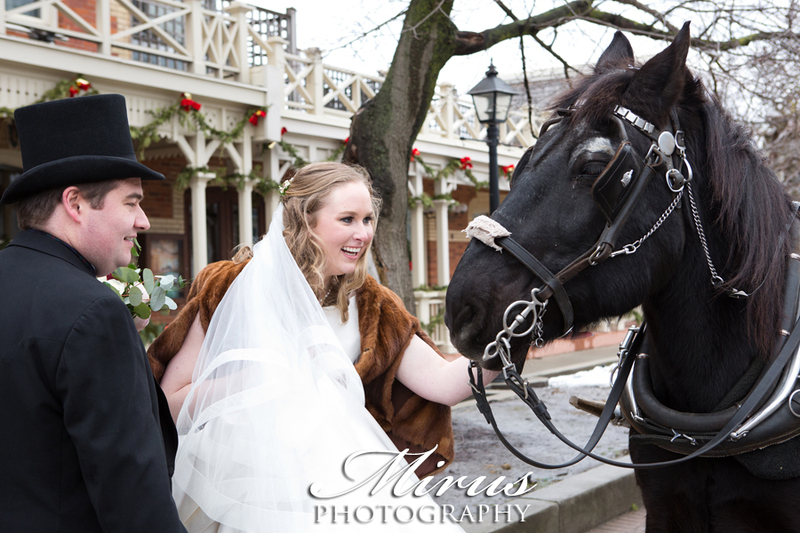 Many people complimented them on their attire as they strolled through Niagara on the Lake taking their photos.Afterward they took a romantic horse and carriage ride through Niagara on the Lake to Queens Landing Vintage Hotel. 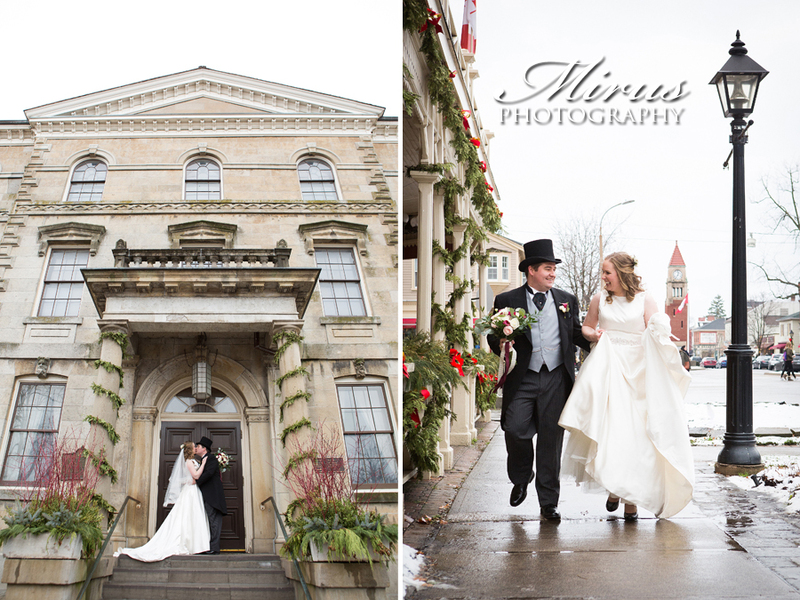 Their ceremony was held in this location which was just a gorgeous spot for a wedding ceremony in the winter. 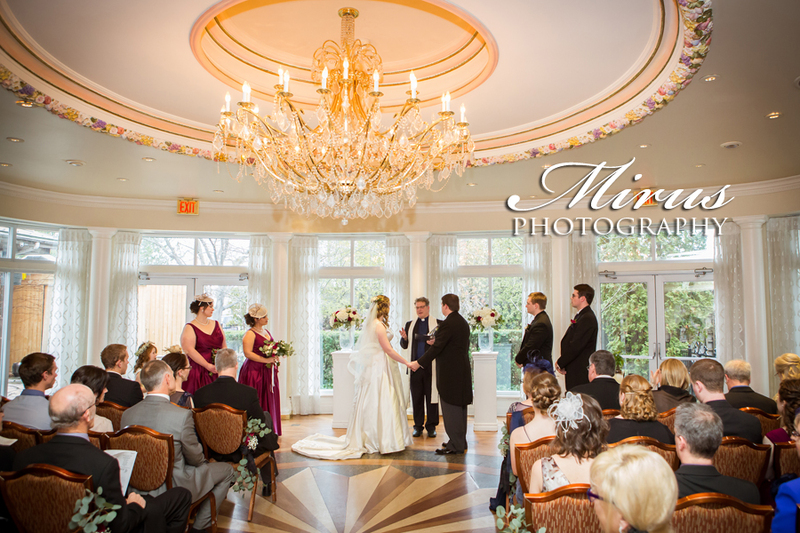 All behind them were a wall of windows and in the center of the room a gorgeous chandelier. 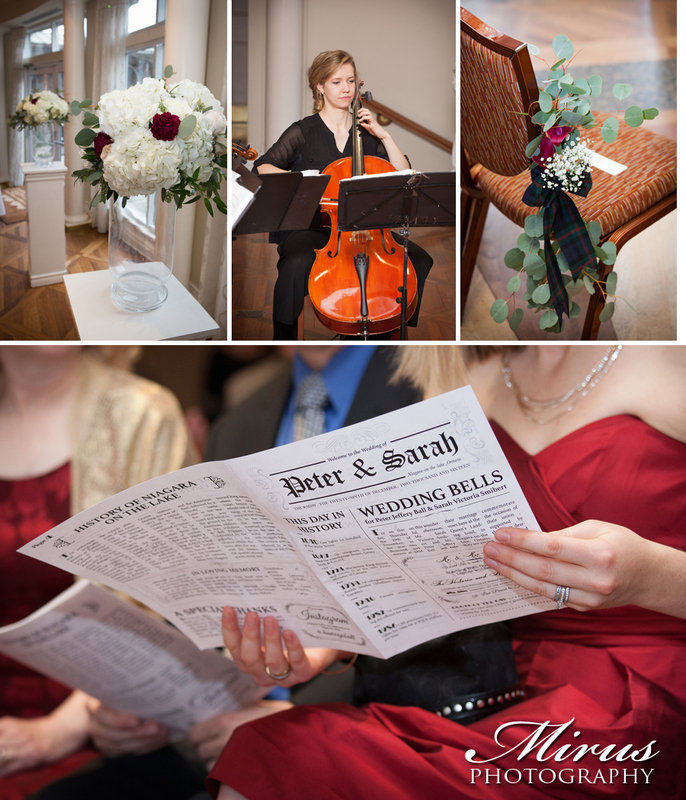 On their guests chairs when they arrived were a newspaper that Sarah and Peter had made with things that had happened in history on the date they were married. 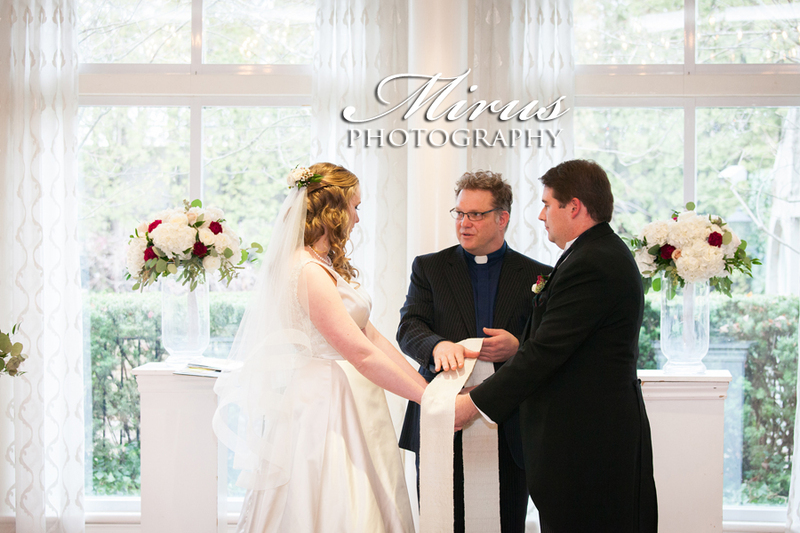 Also had their wedding announcement on it. 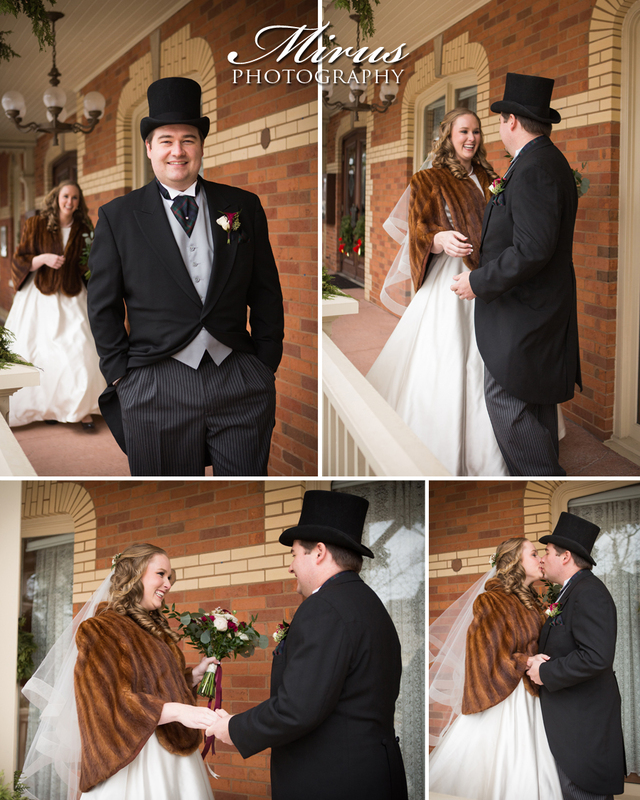 Even more beckoning that old world feel.Following that they were taken back to Prince of Wales Vintage Hotel for their cocktail hour and reception. 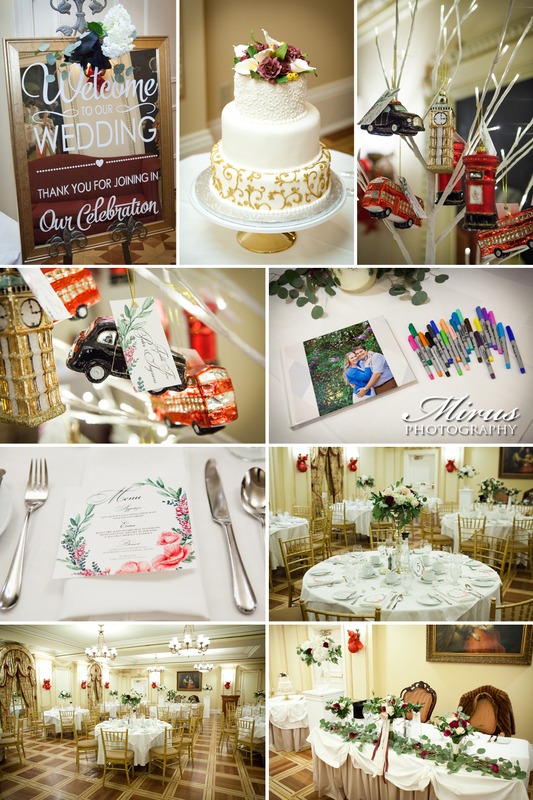 Sarah and Peter's wedding favours were Christmas ornaments that were found on a tree which also contained their guests table number for dinner. 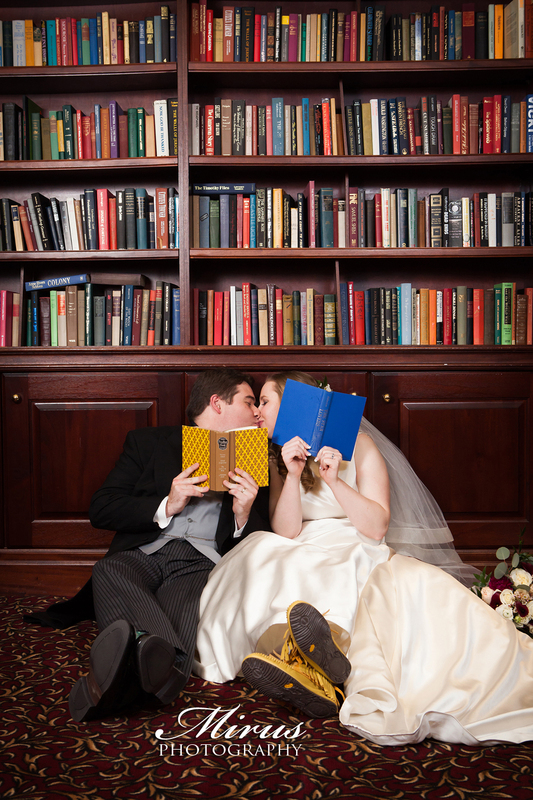 We thought they were really fantastic. 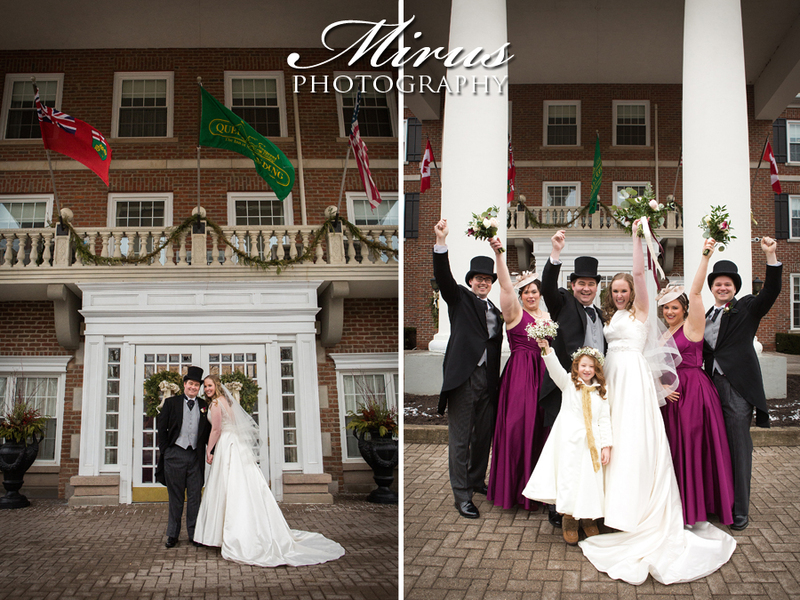 They were English themed and their wedding guests really loved them!We wish this couple many years of love and romance. 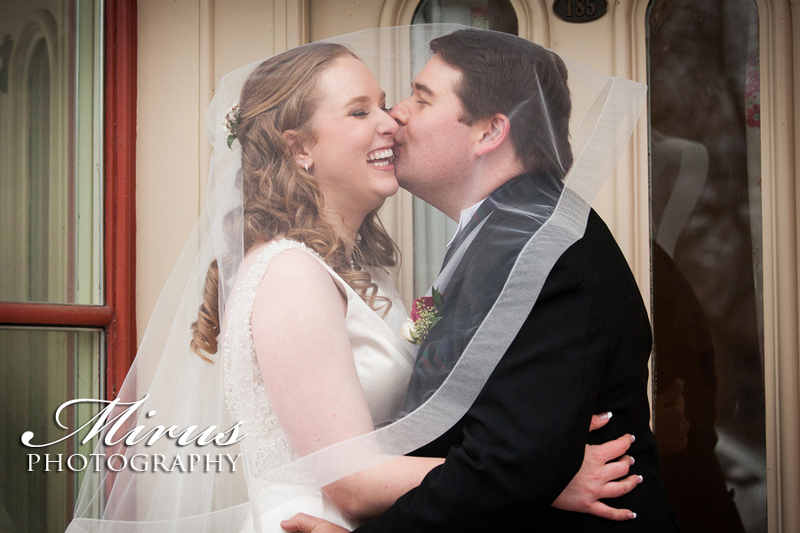 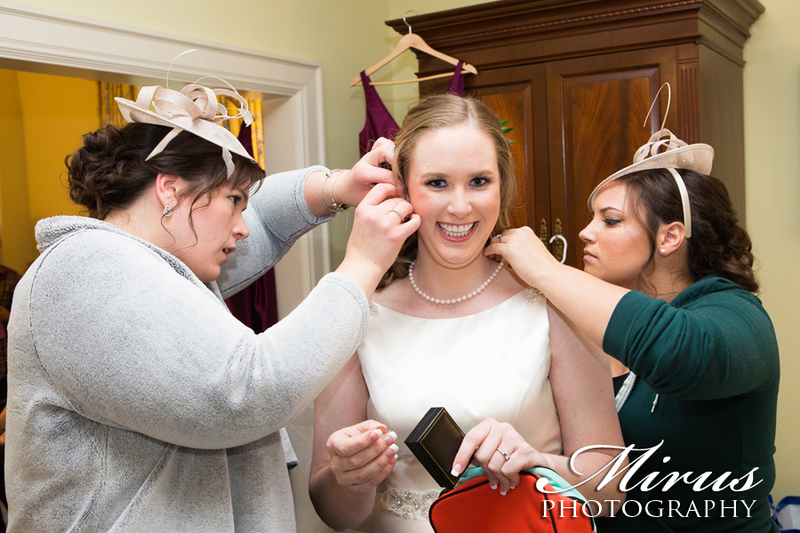 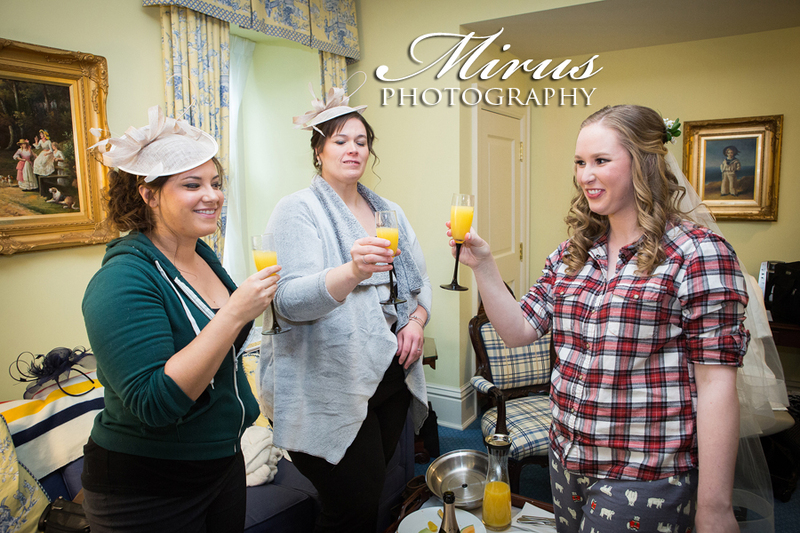 Thanks for having us photograph your old world wedding day!